The structure of 5,5-bis(bromomethyl)-2-methyl-2-phenyl-1,3-dioxane 1 has been studied by means of 1H and 13C NMR spectroscopy as well as X-ray diffraction analysis. The molecules of compound 1 exist in the chair conformation with the axially oriented phenyl group. The computer simulation using DFT approximation at the PBE/3ξ level has revealed the route of interconversion of the ring and the optimal conformation of the phenyl group corresponding to the data of X-ray diffraction analysis. Russian Text © Sh.Yu. Khazhiev, M.A. Khusainov, R.A. Khalikov, T.V. Tyumkina, E.S. Meshcheryakova, L.M. Khalilov, V.V. 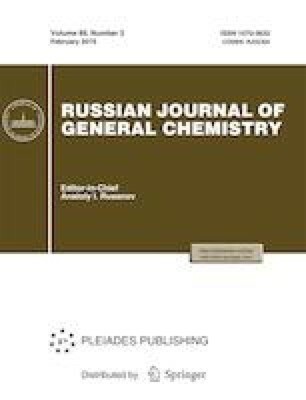 Kuznetsov, 2019, published in Zhurnal Obshchei Khimii, 2019, Vol. 89, No. 2, pp. 197–201.